Check your dipswitch. In the picture I noticed something off. You have it off on off. There is no such setting. The dips are reverse from normal on off. That’s what I said. If he has the same tb6600 then his dips are wrong. Look at the picture carefully. Oops I triple checked. Missed the 1/8 step being off on off. Looked over the list and missed it twice. I just finished my quick and dirty assembly of my controller. Should be ready to test this weekend. Provided that I can finish building my shed before the storm. Okay, could not sleep last night and almost read this whole thread. 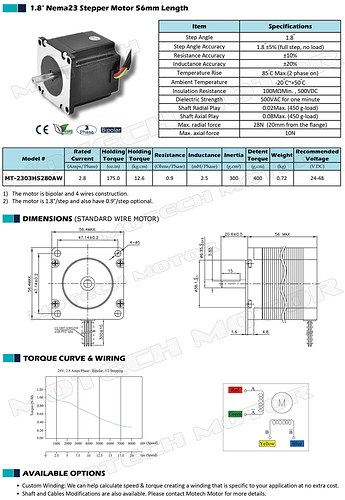 I attached a picture of the driver and of the motor description. all are crossing each other. It is quiet messy. Using 18awg cables from drivers to motors (through a drag chain) and 20awg cables from drivers to Arduino (R3) screw shield. air and it seems like it is mostly the X-axis. And I just ordered 2x 120mm fans to make sure this is not the probem. 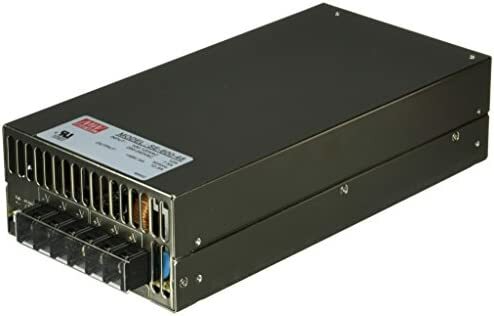 I was wondering if any of you kind intelligent friendly and may I say handsome folks could help point me in the direction of a power supply to drive 4 of the 269 oz steppers? @48 you get better performance I’m told. 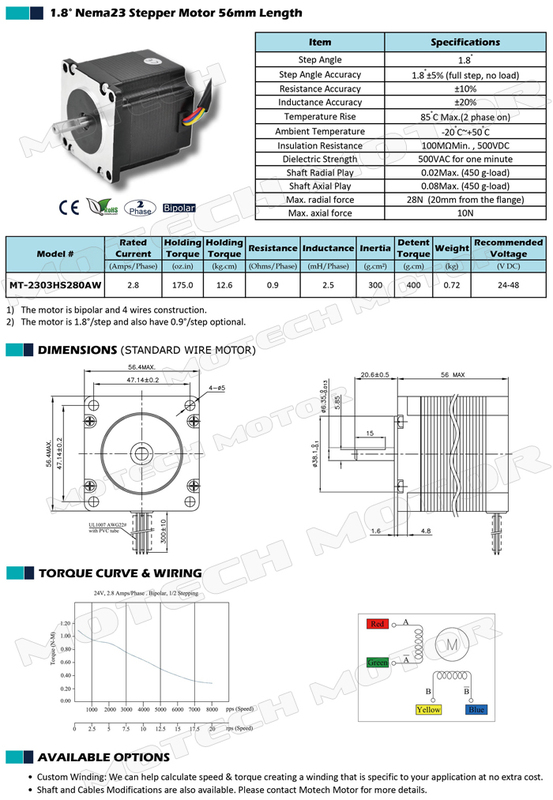 If the stepper drivers support 48V. The best analogy is filling up a bottle. Does it fill faster with the faucet turned all the way up or halfway? That’s kinda what 24V vs 48V is. If the stepper driver only take 40V “pressure” then 48V will make it leak/rupture. But if the stepper driver happily accommodate 48V “pressure” then the added pressure can provide more power at higher pressure levels, assuming same current capacity. Keep in mind that most of these power supplies are adjustable. And I have mind down tuned to drop B. Aka dialed down to 42v for the tb6600. Most of these cheap controllers use Toshiba chips. While some are TB6600 most are a newer surface mount chip in that family. That 40 or 50 volt rating is a max rating. Go above that and the chip will take damage. These are FET switching controllers. Therefore they are AC driven, Not constant voltage. The problem is switching transients can be much higher than the power supply voltage. There needs to be head room to protect the chip. The higher the stepper inductance the more switching transients can be a problem. Also, the higher the voltage, the more heat is produced in both the chip, caps and steppers. Toshiba notes this in the data sheet. I have been driving 3 385 OZ large inductance steppers at 30 volts for 2.5 years now and have not had any problems. This is with a Toshiba chip rates at 40 volts Not the TB6600 rated at 50. The web is full of people trashing these controllers because of failures. There seems to be a correlation with high voltage and failure. Give yourself some head room. Now there are some drivers out there that use discrete FET design and are much tougher than the single chip design. About 3 times the price compared to these at the low end. If you choose to drive these controllers at high voltage and they fail then Know that that was your choice. @PhilJohnson and @Phantommwould would you guys recommend this alongside the ball screw upgrade? thanks phil I have the same one, maybe I’ll pick up a second lol. Think by the time I’m done with the upgrades I have half the parts for already i’ll be able to assemble a stock xcarve from the take offs. Thanks for the recomendation Phantomm, how do you adjust that model power supply? Just dial the pot near the dc out. And use a multimeter. I’m in the process of building a Phil style controller and am looking for some grounding advice from the electrical guys. I’m using separate DC power supplies for the Arduino (9v) and the stepper drivers (24v). Reading up about ground loops, I’ve connected the grounds for the 2 supplies at the point plugs on the case only and run separate ground wires out to the various components. 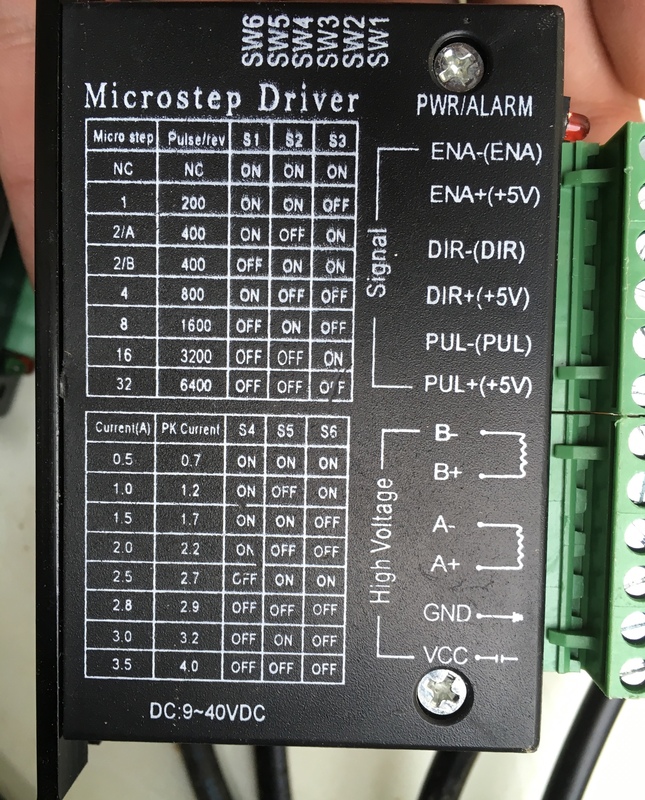 I’m using stepper drivers similar to the photo in the post I’m replying to. 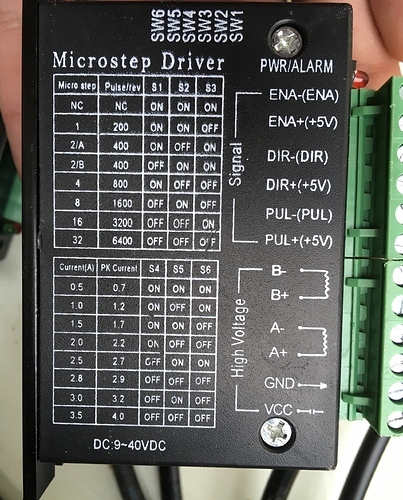 On the signal side of the inputs I know I need to tie ENA-, DIR- & PUL- to ground, but should that ground run back to the Arduino or should it be connected to GND on the high voltage side of the stepper driver? I have mine running back to the ground on the arduino. Why are you using a 9v adapter for the arduino when it will be powered by your computer when you connect it via usb? Why are you using a 9v adapter for the arduino when it will be powered by your computer when you connect it via usb? I had terrible noise issues with the UNO only receiving power from the USB. After I fed it a separate 12V line no trouble. I built and have been using this controller for some time, very successfully. Now I am considering a Triquetra Touch Plate. Has anyone tried one with this controller? I am thinking it will work fine. Do I need homing switches to work with Charley’s touch plate? I currently don’t have them and have never seen the need.